Griffin was speaking to a student radio station at Dublin City University in an interview to be broadcast later today. 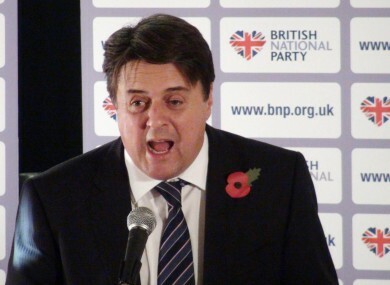 THE CHAIRMAN OF the British National Party, Nick Griffin, has said he complained to gardaí about the protests that led to the cancellation of a scheduled appearance at Trinity College. Griffin, who is an MEP for north-west England, was due to address a meeting of the Philosophical Society at TCD but after protesters disrupted another of the society’s debates, it decided to cancel the event due to fears over the safety of staff and students. Speaking in an interview with DCUfm, Griffin said he had complained to gardaí because of “very clear” evidence that the law had been broken and accused protesters of “a form of left-wing fascism” in disrupting the debate. “Clearly in fact the college don’t encourage balanced debate and free speech because when they came under a bit of pressure they simply said to me ‘Well don’t come’,” Griffin said. However he said that the fault was not with the society or the college but the police in not upholding the law. Griffin said they needed to “come down” on people who disrupt events and used “fascist methods” against political opponents. “They can object to me, they can object to my message but they need to come along and talk about it, and not threaten people,” he added of the protesters. Griffin was due to attend a debate on immigration, entitled: “This House Believe Immigration Has Gone Too Far”. The Union of Jewish Students in Britain and Ireland had condemned the invitation and called on Trinity College “to deny the BNP a platform”. In the interview to be broadcast on DCUfm at 4pm today, Griffin also denied that his party is a far-right one. The BNP’s 2010 general election manifesto stated that it would halt all immigration, deport all illegal immigrants and deport all foreigners convicted of crimes in Britain as well as repealing race relations legislation and the Equalities and Human Rights Commission in the UK. I would say [we're] genuine in the middle. On say some social issues, immigration perhaps our views are right wing. “On the other hand where we want to clamp down on the banks and stop the bailouts and protect ordinary people and nationalise for instance the new shale gas industry, traditionally that puts us on the left. “So we don’t really fit in the spectrum anywhere,” he added. Poll: Should far-right groups be given a platform to speak? Email “BNP leader says opponents of Trinity debate used "fascist methods" to stop it”. Feedback on “BNP leader says opponents of Trinity debate used "fascist methods" to stop it”.